Over recent weeks I've come to appreciate just how great a venue downstairs at Oran Mor is. Partly it's the 'regular' audience and the enthusiasm they bring with them (and the Pie and Pint surely help) but it's also the physical space itself. The low ceiling adds a level of compression and intensity that a bigger space can lack. But everything I've seen there previously has been largely comic, and I've often wondered if the 'comedy club' vibe would work for a serious play. With this week's "King Lear" I doubt I could have come up with a sterner test - yet it passed with flying colours. I'm really not familiar with the full text but what Paddy Cuneen has achieved in his adaptation of the play cut down to 45 minutes is pretty incredible. The reduced plot is concise and coherent - so much so that I'm sure I would now find watching a 'full' version intolerable slow and bloated. Cara Kelly brilliantly makes Goneril more sympathetic than she has any right to - while her actions can't be condoned it's impossible not to appreciate her genuine difficulties and frustrations in handling Lear. Jennifer Hainey as Regan brings an air of superiority approaching smugness that fits perfectly with the character. Danielle Stewart's Cordelia doesn't have the opportunity to make a real impact but as the Fool she gives a wonderful performance with an almost tangible warmth for Lear. I've always believed that great performances come from the eyes and Stewart exemplifies this beautifully here. 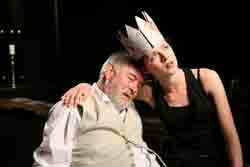 And then we have Micheal Mackenzie's King Lear - perfectly combining moments of powerful rage and quiet distress. The audience were clearly impressed with the piece and it's a pity the staging makes it difficult for the cast to be brought back for a second curtain call - they certainly deserved one and I'm not sure we were a million miles away from the beginnings of a standing ovation - and I'm not sure I wouldn't have joined in. "King Lear" has now completed its run. Next week's Corona Classic Cut is "The Shoemaker's Wonderful Wife"
This was my first experience of PPP (University lecutures always clashing) and I really enjoyed the productions. Great that lunchtime theatre can have a home in Glasgow! I'll be back for Anthony & Cleopatra hopefully.